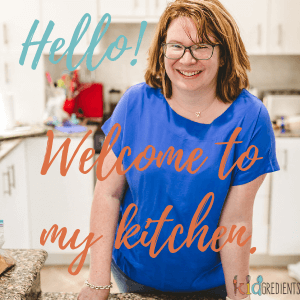 You are here: Home / life / Reviews / Yumbox Minisnack review and how to get one early! So I’m probably not telling you anything new, but I’m obsessed with the Yumbox. So when Megan from Yumbox Australia (minihippo) sent me two yumbox mini snacks to try out, I was over the moon. She had hinted they were coming a while before that…and the next thing I knew they were in my hands! You can read my Yumbox Minisnack review, then decide if you want NEED one! If you’re wondering what the big deal is, the yumbox is leakproof and compartmentalised and perfect for little lunches. The minisnack operates on the same principles, it is leakproof from compartment to compartment, the lid seals completely so it’s leak proof and it has 3 compartments, perfect for laying out the perfect recess snack. There’s no doubt that Yumbox are extraordinarily good at what they do, and the minisnack is no exception to that. It’s easy to open, holds 1.5 cups of food and is tough. It’s deeper than the unusal yumbox and does contain a surprising amount of snack! Our favourite way to use it is to have fruit on one side and crackers and cheese or muffins on the other, or cookies, or anything really. The small treat section for us either contains blueberries or carrot sticks or sultanas, or something else just as yummy. They have the usual yumbox design, with the removeable tray and clip on the front. You also need to know this: if you aren’t quite in the yumbox market yet- i.e. your kids aren’t having lunches out and about or you’re just feeding a toddler, you will be glad to hear that even yoghurt in this doesn’t spill in your handbag! What else do you need to know? Well, they are being released in 3 colours, pink, blue and green and are going to retail at $26.95 each. They’ve just opened preorders for these in Australia, but I have two…brand new ones to give away thanks to Mini hippo Australia. So if you’re lucky, you can enter below and win one, meaning that you’ll be one of the first people in Oz to have them! Check out Mini Hippo for all the other info you need: facebook, instagram or their website: Yumbox Australia. Want to win one? Comment below with what you would put in your Yumbox Minisnack and what colour you would like (pink or green). This is a game of skill, the best two answers will be chosen. Open to Australian residents only. Competition closes on Friday 1/7/2016 at 4pm and the winners will be announced on facebook and in this blog post comments. Winners will receive a brand new, Yumbox Minisnack in either pink or green. But will the princess get her Yumbox? Will she never again mutter that sentence? Will her mother be spared?
? Green one would’ve fab ? Ooh I so need this for my toddler. I’d fill it with blueberries, yoghurt dip and kiwi fruit slices – basically all his favourite things! This would be a perfect size for after school snacks. I would love a green one to fill with toasted mountain bread chips with homemade chunky corn, avocado and tomato salsa. Add a little grated cheese or sour cream to the small well to really top it off. 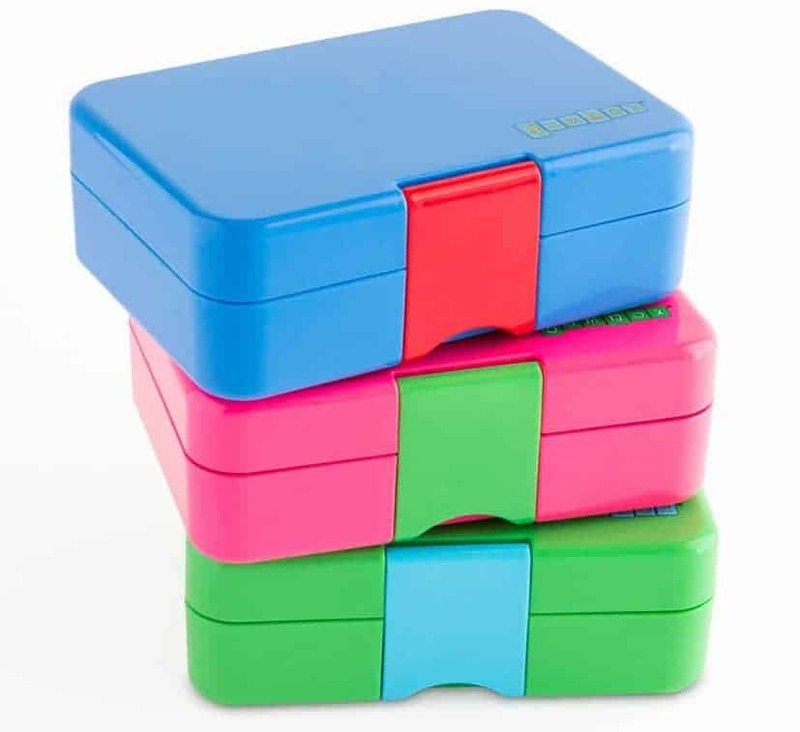 Mini yumboxes are super cute! We would fill ours with strawberries on the right with yoghurt in the mini section for dipping! On the left would be vitaweats with butter and Vegemite. Perfect for munching on. I would love the pink one for my 18 month old. She has been using her sister’s yumbox during weekends. With the mini, she will have her own? with ? and favourite fruits ?,?,? and ?! My daughter loves the pink one I would put some yogurt in it for her it’s the perfect size for her. Would add some small sushi pieces and some fruit the perfect snack. Would love a pink one please. I would put fruit and veggie sticks on one side with dip and the numerous variations of your receipe for youghurt dough scrolls ( sweet or savoury) on the other side. Green please. I’d be filling it with egg free pancakes with fresh strawberries, raspberries, apple and banana, and yoghurt. My 3 year old son loves to pack his own snacks whenever we go out. He would love to pack strawberries ,blueberries ,cheery tomatoes and cheese cubes in a GREEN Yumbox Minisnack. These look perfect for my toddler! I think I’d pop his favourite lunch inside: grapes, funbite square cutter sandwich bites, and maybe some rice crackers if he’s really hungry! My daughter would definitely choose carrot sticks and dip if she pinched it for school! A green one would be great for either kiddo! These would be perfect for recess or school fruit break. My daughters favourite is hummus with carrot, cucumber and caesium sticks. I would love the green one to make a small lunch for me! Sweet potato chips with garlic aioli and some homemade chicken nuggets would fit perfectly in here!!! We have yet to try a yumbox. With little miss heading to big school next year she has said she would like to put all her cucumbers in there and some carrots. I said what else she said surprises. She has asked for Pink to match her new school bag. Love the pink colour so much , I’ll fill in watermelon and biscuits, my daughter love this combination but I can’t put those 2 foods in normal container , because it leak . If I have a yumbox mini , i don’t need to worry about that because it’s leakproof. Forget the kids! I’m a 65yo who volunteers at a recycling shop once a week and I take the train. I need a leakproof box that can sit at any angle and hold my snacks or lunch. Usually Labne or yogurt with veggie sticks or fritters and a protein like sardines or tuna. This product looks great! So awesome! I’ve been searching for a seal-able lunchbox option for ages – yogurt leaking is the worst! My 3.5 year old loves big flavours, so I’d probably put some goats curd in the little middle section, and crackers or bread in the main bit, and olives, cornichons, caperberries, etc in the other. Then she can mix and match however she likes (minus the soggyness!) I would choose green, because green is such an awesome colour, don’t you think? With a busy schedule of therapies for my girl, she need snacks that travel well, to carry fruit slices, crackers and dip or yoghurt and vege dippers, this container in any colour would do the trick. The green one would be amazing!! I love these, such a great idea! This would save me packing a bunch of mini containers, each with different foods inside. I’d fill mine with my roasted pumpkin, spinach and feta rolls, blueberries and carrot sticks (these never get eaten, but I figure one day…maybe?!). I would fill it with my own lunch! I’ll take it to work and pretend to my colleagues that my child keeps leaving his lunch in the car ?. I would LOVE a green one! I cannot wait to get one of these for my almost 2 year old. I would put in a mini cheese and bacon roll, Greek yogurt and some sliced up banana rolled in coconut. As I have two girls I would have to go with pink to match our other lunch boxes. Would love a pink one for my miss 7, I would put sushi, cheese & crackers, fruit, scrolls, muffins, dip and veggie sticks. ooh this is a hard one, there so many things I would love to use this for! My daughter is quite fussy and struggles a lot with eating so this would be great for her to see the portion size and have fun eating out of it. And when not in use (if I don’t take it myself haha) it would be great to store some of her little craft pieces in such as pencils, little star cut outs, little gem stones and other little decorative things for her to use finished of with some paper on top for a little craft set on the go. If we won it would mean the world! any colour would be good but maybe if possible the pink one would be great! Yes please i would love a pink one. My little girl loves only a small portion of fruit and yoghurt for recess as it gives her more time to play?? ?.This is a perfect option as its leak proof too. I have 2 Yumboxes and mums always ask where they are from. This smaller one would be awesome for my little man’s antipasto selection he loves ha ha. Dip, cheese, olives, crackers. Perfect for morning tea and perfect for starting kindy. I just asked which colour.. oohhh “green, i love green” he said. (Pretty pink please!) I’d put mess free bite size food in the mini box for my 2 year old so she can help herself while I have my hands full with my 4 month old. Grapes, baby tomatos, blueberries, and mandarin pieces on one side, cheese and crackers on the other with pine nuts in the well. Fast forward and I’ll use the mini for the little one; rusks for teething gums, Greek yoghurt or purée veg on the other, and maybe a little treat in the well for me! These are a few of my yumbox things. A pink one would be lovely but would be happy with either colour. Yes please! I’d put fruit on one side, rice cakes with Vegemite on the other and a bliss ball in the mini circle for a sweet treat! We LOVE our YumBox full size so I can imagine the snack version is awesome too! My 9 yo boy would be ecstatic. He loves helping come up with. Ew creations for lunch and loves helping to pack. He literally eats anything even if it’s yuk. But it’s healthy and good for me mum so I eat it. I would love the pink one. Vege sticks and dips would probably be what I would put in the yumbox! With a Yumbox Minisnack my son’s food would be on track, he’d eat his fill without a spill, of everything from savoury to sweet packed. Green please. I’m happy with any colour, my little boys okay with pink?. Forget the healthy options! I’m keen to fill it with chocolate! I wonder how much I can cram in there to get me through a long day! ? A pink one for my daughter in prep this year, we would fill this with goodies for her snack time, with her mum (me) being Oc I like things matching, so this will go well with her larger original yum box. I would put fresh hommus, carrot and celery sticks, and chicken and avocado pinwheels. Pink please. Pink please! I would keep the yumbox for myself and fill it with a little picnic platter. Brie cheese, crackers, carrot sticks all to go with my WINE! During the week I’d fill the minisnack with all the leftovers from making my sons lunch for a little lunchbox for myself 😛 and on the weekend I’d use it to make sure he’s fed and happy while mummy sleeps in! I would love a green one so i can stop using zip bags. I would put watermelon, car shape sandwiches, fruit bars, biscuits in it. I’m a feeding therapist and I’m wondering if this would suit my patients- on one side- foods that they eat and the other side- foods that they are learning about. Neither touching each other but still in the same box to help increase food exposure. And of course this would be perfect for my own kids- great size, love it! Hi Amanda, CONGRATULATIONS! Please send me an email to info@kidgredients.com.au so we can arrange your prize to be sent to you! to store yummy crackers, vegie sticks, dip and more. Oh pick me pick me!!!! I have 2.5 year old twin girls and we love our Yumbox originals! I would fill the snack one with hummus and veg sticks, apricot bliss balls and yoghurt coated cranberries! I’m yet to try yumbox and know my boy would love it!!! Well my son can’t get enough of chicken avocado wraps so I would do these along with homemade beetroot hummus, cheese celery and fresh fruit salad. He would go nuts over the groovy green ? Inside of a Yumbox- wow! As a mommy truly obesessed with the wonders of yum box, I wait to try the snack size for my new little one!!! I would adore the pink to fill with homemade apple sauce, baby crackers for the middle and some steamed broccoli and carrot. Perfect for baby’s first solid foods on the run!! 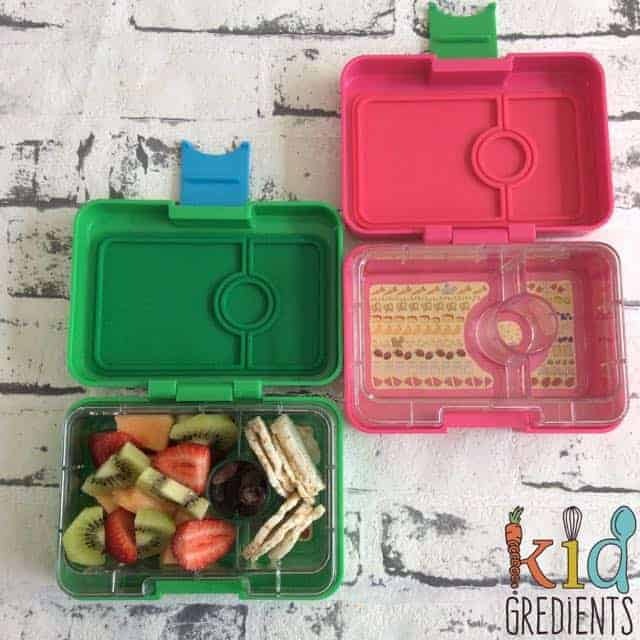 My mini man would so love a green Snack yumbox! To date we’ve used Easy Lunchboxes for the older kids, and Munchboxes… so make me a convert! The Green please. I’d make a mini yum box filled with folded cold meats, small variety of cheeses, hommus dip and crackers. I have just shown my 6 year old daughter and straight away she said mum this would be perfect for morning brain food at school. She would fill it with berries, rockmelon, mango and yoghurt. Pink was the favourite colour ? Oh my gosh I need one to try out. My cousin has them in America and I just have to show her the great snacks I can pack in them here in oz…. I would fill as my son requests rice, chicken nuggets and ketchup and his favourite colour is Green . It would be perfect for a after auskick snack. Toss it it the footy bag for a easy snack, after the final whistle blows. A green would be great. My little girl would love the pink. In the big section I’d put her fav lunch, a salad of lettuce, cucumber, carrot, kalamata olives and lemon dressing. I have been waiting for it seems forever. I’m keeping it for me. My little guy has his own so I am next in line. It would be a snack box. I just made an amazing coconut cake, some delightful cheese and some musketel grapes. I have got all of my friends to buy the Yumbox so I would love to show off the Mini ? Goodbye packaged snacks for good! Oooh! Love our Paninos but these look great when we don’t need as much food out and about! My boy eats between school drop-off and his daycare drop off (yes, he has breakfast before that!). Green would be great – would fill with delicious and wholesome snacks. Strawberries and sliced Apple a favourite. Some crackers and sultanas would fit wonderfully! I would fill my daughters yumbox minisnack with a greek yoghurt savoury scroll (ham pineapple & cheese), a hard boiled egg, Mandarin pieces & dried banana chips and yoghurt covered sultanas in the little treat section. I would fill it with healthy snacks to eat after my weight loss surgery perfect size. It would be perfect for sunflower seeds, pumpkin seeds and goji berries, a little bit of chobani yoghurt and then some cheese and ham. And then I can match my daughter with her normal size box. Pretty please pink ? Bikkies and cheese are a big favourite in our house…..Brie is the cheese of choice if you can believe it! We are a Yumbox house with 3 kids under 6 so either color is fine as i have 2 girls and 1 boy. ? Absolutely can’t wait until they are available in Oz. My little man would have a homemade lunch to take to his Gmas filled with fruit, a muffin and a Hersheys Kiss ? as a treat. I would love a green one ? I would love to win the pink one for my baby girl to put all her snacks in, if I am going out for the day. I would put in some watermelon, baby rice crackers, homemade baby custard and some sultanas. I have wanted to try the yumbox’s for a long time bit the price has always put me off! Having a freebie would be a great way for me to determine if they are worth the money! My son loves taking watermelon to school! But the juice gets everywhere in normal lunchbox’s 🙁 so i would put in yogurt, watermelon and mayby some mini marshmallows in the centre 🙂 perfect recess! I’d love a green one for my son. I’d fill it with fresh fruit, greek yoghurt with honey, homemade muesli bar and a little piece of dark chocolate for a treat. We love our Yumbox’s already and I would love this for my little miss. We would add Strawberry Jam love heart sandwich pieces, jatz with cheese cut into circles, a boiled egg hatchling, some fresh strawberry pieces and a few pieces of beef jerky as a treat! I can not wait to fill it up! She would love Pink! That should say cucumber carrat and creamed cheese with garlic bread. Green box as well ? Hi Renee! CONGRATULATIONS!Please send me an email to info@kidgredients.com.au so we can arrange your prize to be sent to you! Wow thank you thank you! So excited. Have sent you an email ? and she will adore the pink. Would have to choose pink, and fill it with some Beetroot, feta and mandarin salad some pita bread chips and a little humus in the centre, my baby girls favourite. I’d fill it with ice cream, blue berries and mm’s!! At least when the ice cream melts it wouldn’t leak! And pink please or green their both awesome! Plus I would add a few other bits and pieces. Oh and I would choose Pink please! to keep those vitaweets that are a fad. “And the jam sandwhich” cries Master two! All the goodies to fill a boys tum ? Definatly pink for my miss one…would be perfect to make her food look yum and delicious. It would be filled with lots of home made goodies, as shes dairy an gluten intolerant hers would contain- veggie frittata, date n coconut balls veggie sticks with an avocado dip. Love our big Yumbox & a mini one would be a perfect addition!! A pink would be the choice for my little Miss whose 7th birthday is just the day after the competition closes! I’d love to fill it with blueberries & strawberries in the small compartment & a mini bagel with cream cheese in the large section & some sprinkles in the ‘well’ to sprinkle on top ? These snack boxes look so cute. I would choose a green (to use with either child) and pack it with homemade donuts (current craze), fruit, hommus/crackers. Love the idea the compartments are watertight between each other so you could put something wet next to something dry with soggy biscuits! Packed in to make her grinny! So the pink one would be fun!! Thanks and my fingers are crossed!! My daughter would love one with yoghurt and fruit salad. Maybe a sneaky treat in the smaller section. Would love either colour, however green would be the pick. I would put fruit salad in the big compartment and some yoghurt into one of the small ones. Then some sushi into the other small one and some yoghurt drops as a treat. Love Love Love! My daughter would love a Pink Yumbox perfect for her kinder snack. It would be filled with crackers with homemade hommmus, zucchini bread, a couple of bliss balls and some cut up seasonal fruit! I would love a free. One for my one year old twins! I would put carrot, zucchini and cheese Omlette pieces in along with Greek yoghurt drizzled with honey and strawberries. Yum! That was meant to say green! ? Love the travel Lego idea!